If you get the bus from Barajas to Avenida de América (the 200 – best deal in town and at only 1.50 the cheapest way to get from the airport into town!) you may spot this unusual building to your right. It leaves no one indifferent and love it or hate it, Las Torres Blancas will make an impression. I had only seen it through the window of a moving vehicle until a few years ago and I had wondered about it – you won’t have seen anything quite like it before. The circular grey stacks make an incongruous sight in a city such as Madrid, which is pretty low-rise and very much not a concrete jungle. It is so ugly! Or so I once thought. Then I started working in a school right next door, and got to look out at it from my classroom for 3 years. As I became accustomed to these architectural carbuncles, I became fond of them and finally began to appreciate their unusual appeal. 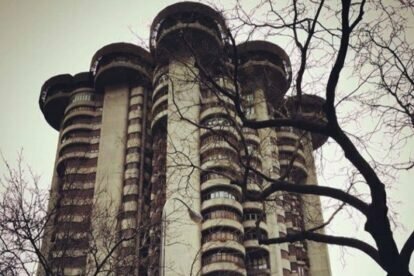 81m and 23 storeys – when this building was finished in 1968 it represented the height of cutting edge design and the award winning architect Francisco Javier Sáenz de Oiza, who designed it and was influenced by Le Corbusier and Frank Lloyd Wright, lived in it until his death. So keep ’em peeled when you pass by in a bus or taxi – do you love it or hate it?